Peel the turnip with a peeler and slice it paper thin with a knife or cucumber slicer. I recently invested in a Japanese slicer which is similar to a cucumber slicer, but you can adjust the thickness of the slices. You need about six nice thin slices per serving. 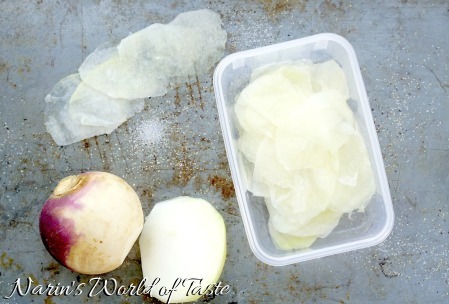 Store the turnip slices in a Tupperware in the fridge until serving. 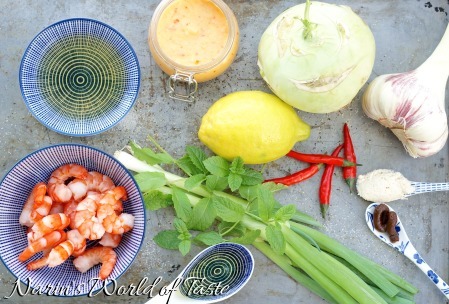 For the prawn filling, slice the prawns into small pieces, wash the mint, lemon, and spring onions. Zest 1/4 of the lemon, slice the spring onion and mint thinly. Cut the avocado in half, remove the pit, then while still surrounded by the peel, cut length- and crosswise through the flesh of the avocado to create small cubes. Do so carefully so that you don’t cut through the peel, then scoop out the cubes with a spoon. 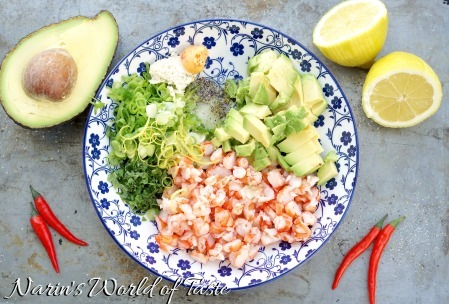 In a bowl, combine the prawns, spring onion, mint, avocado, lemon zest with 1 tbsp sesame oil, 1 tsp lemon juice, 1/2 tsp salt & pepper, and 1 tsp chili garlic paste. Mix everything thoroughly. Store the prawn filling in a Tupperware in the fridge until serving. 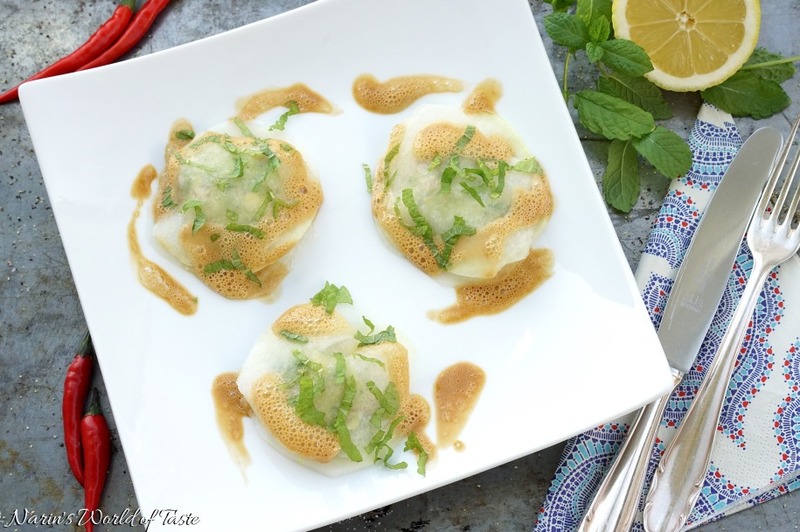 For the miso foam, combine 1 tbsp organic miso paste, 2 tbsp apple vinegar, 1 tbsp sesame oil, 1 tbsp lime juice, and optionally, for a molecular effect, 1/2 tsp soy lecithin together. Blend with a hand blender until foamy. 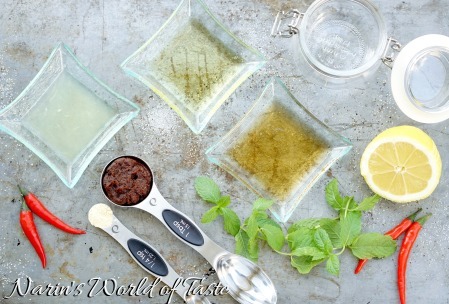 Try to get as much air as possible into the liquid by holding your hand blender at a slight angle, that way it will create a nice foamy texture. Soy lecithin is part of the molecular kitchen and helps maintain the texture of the foam. For serving, place three turnip slices on each plate, add a tablespoon of the prawn filling on top of the turnip, then add another layer of turnip on top which will create a ravioli-style top. 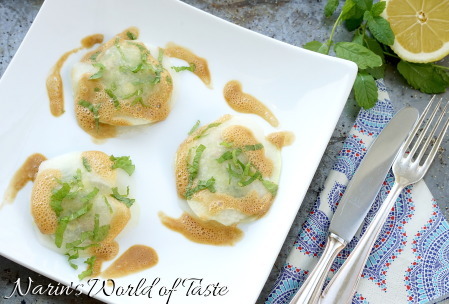 With a spoon, add some of the foam around or on top of each turnip ravioli and sprinkle some mint on top.